The Architecture and Gardens of Mount Vernon ~ The History Girl! The Washington family had owned land in the area of what is now Mount Vernon since 1674, and in 1739 embarked on an expansion of the estate that continued under George Washington, who came into possession of the property in 1754. He became sole owner in 1761 after the death of Anne Fairfax, his sister-in-law, who owned a life estate after her husband Lawrence Washington's death in 1752. The estate was originally known as Little Hunting Creek Plantation, after the nearby Little Hunting Creek. Lawrence Washington, George Washington's older half-brother, changed its name to Mount Vernon in honor of Vice Admiral Edward Vernon. Vernon had been Lawrence's commanding officer in the British Royal Navy. When George Washington inherited the property in 1761, he retained the name. Designed by an unknown architect, the mansion is built of wood in what can be called a loose Palladian style, and was constructed in stages between 1735 and 1787. The first section of the house, one and one-half stories high with a central hall and four small rooms on the first floor, was built by George Washington's father, Augustine Washington, about 1735. In the 1758s, the house was raised to two and one-half stories and was extensively redecorated. In 1774/1775, Washington added his first major wing to the house, which included a study on the first floor and bedroom suite above it. Between 1776 and 1778, the north wing, containing a large one-and-a-half story room on the first floor, was built. Washington called this his "New Room" and was to serve as entertaining space. At the same time, multiple exterior improvement occurred, which include the addition of the piazza in 1777. About 1783/1784, the cupola was added. The final embellishment of the house, a weathervane for the cupola, was not added until the autumn of 1787. One of two quadrant colonnades at Mount Vernon, built in 1778. The main block of the house, which is two-stories in height is known as a corps de logis. A corps de logis is an architectural term referring to the main block of a large, usually classical, mansion or palace and would contain the principal rooms, state apartments, and an entry. The corps de logis is flanked by two single-story secondary wings, built in 1775. The secondary wings, which house the servants hall on the northern side and the kitchen on the southern side, are connected to the main block by symmetrical, quadrant colonnades, built in 1778. The addition of the colonnades created a classical Palladian arrangement and formed a distinct three-sided courtyard, known as a cour d'honneur. The courtyard at Mount Vernon is known as Mansion Circle and gives the house its imposing perspective from the bowling green. The guitar-shaped bowling green with serpentine paths at Mount Vernon evokes the naturalistic style of English landscapes. Its symmetrical appearance, however shows Washington's interest in formal landscaping. The grass on the green was regularly cut with scythes and smoothed with a roller.Washington also designed an upper and lower garden, kitchen garden, and a small botanical garden, Adjacent to the upper garden he built a greenhouse (the second largest building at the estate) for exotic plants. The Upper Garden and Greenhouse at Mount Vernon. The wood exterior at Mount Vernon appears to look like cut stone through a process called rustication. Rustication is achieved by cutting and beveling the wooden siding boards at regular intervals to simulate stone blocks, and by applying sand to the surface to imitate the rough texture of stone. In 1796, Washington wrote specific directions for rusticating the mansion, which survive today and have been used during restoration. The sand is applied by tossing it onto wet paint until the paint cannot absorb anymore. The sand used comes from the same locally-sourced limestone that Washington used in 1796. The weathervane on the cupola at Mount Vernon was commissioned by George Washington when he was at the Constitutional Convention in Philadelphia in 1787. Based upon directives from George Washington, Philadelphia architect Joseph Rakestraw designed the weathervane as a dove of peace with an olive branch in its mouth. It was constructed from copper with an iron frame and lead head. The original was removed from the mansion in 1993 due to environmental concerns and is now on display in the Museum and Education Center. After his presidency, Mount Vernon remained Washington's country home for the rest of his life. Following his death in 1799, under the ownership of several successive generations of the family, the estate progressively declined. During John Augustine Washington III's ownership of the property, the house continued to fall into disrepair. In 1858, Louisa Bird Cunningham was traveling on the Potomac River and passed by Mount Vernon. She was struck by its dilapidated appearance, and fearing that it would soon be lost due to lack of upkeep, Cunningham wrote a letter to her daughter Ann Pamela Cunningham. In the letter, Cunningham commented that if the men of the United States would not save the home of its greatest citizen, perhaps it should be the responsibility of the women. After convincing John Augustine Washington III to sell the property, Cunningham and the newly established Mount Vernon Ladies' Association raised $200,000 to purchase the mansion and two hundred acres. The Mount Vernon Ladies' Association took over operation of the estate in 1860. 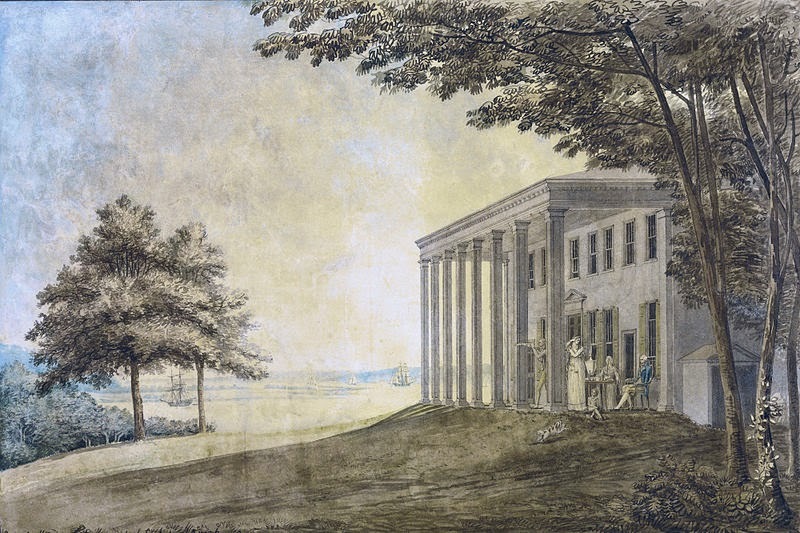 The Mount Vernon Ladies' Association was the first national historic preservation organization and is the oldest women's patriotic society in the United States. During the Civil War, the estate served as neutral ground for both sides and escaped the damage suffered by many plantation houses in the area. Today, the Mount Vernon Ladies' Association maintains a headquarters on the Mount Vernon property and open it to the public 365 days per year. Mount Vernon was designated a National Historic Landmark in 1960 and is today listed on the National Register of Historic Places. The property contains many original, reconstructed, and replica outbuildings including a smoke house, wash house, stable, gardener's house, and slave quarters. Two vaults, one of which contain George Washington's remains, can also be found on the property, ensuring that Washington retains a watch over his property that he so lovingly cared for. And just three miles away are Washington's reconstructed grist mill and distillery, providing insight into additional agricultural and entrepreneurial pursuits that Washington delved into at his Mount Vernon estate.